Ingredients for the Panna cotta. 3 teaspoons powdered gelatin , add two tbsp of water to the gelatine powder and leave it for few minutes. Add all the ingredients to a pan and bring to a boil. Add the gelatine mix and stir fast and then pour the mixture to moulds or glasses. Set in the refrigerator for at least 3 hours. 20 to 30 ml or accoring to your taste, good quality balsamic vinegar. Place all the fruits together with the balsamic vinegar and thesugar into a large bowl and toss together. Allow to marinate for three hours, tossing occasionaly. 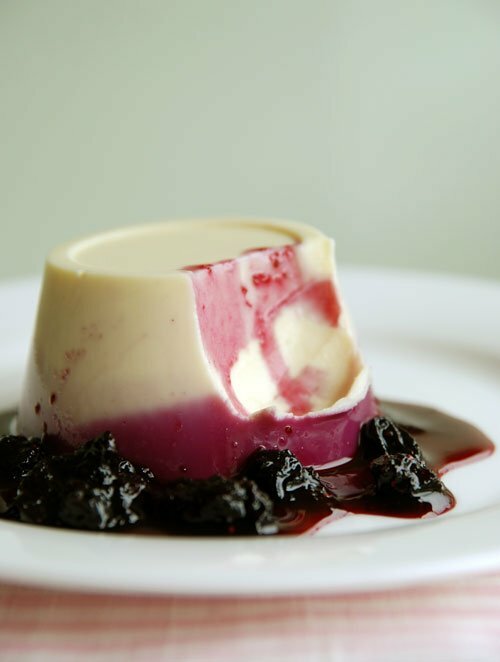 For plating the dessert i dipped the moulds in hot water very brieflt to loosen it.Tip them out into the middle of the plate and spoon the balsamic berries around the edge.Enjoy the exqusite dessert.